The Sanderson Sisters have left Salem, Massachusetts and have found themselves at the Los Angeles hot spot – the Los Angeles Rockwell Table & Stage for the exceptional production of “UMPO: Hocus Pocus.” Hocus Pocus is one extraordinary and spook-tacular movie that has truly made a great impact in all of our lives and it’s a fan-favorite film that gets us all in the Halloween spirit. So, what better way to ring in our favorite holiday than by brewing up some excellent excitement in the witch’s cauldron and watching the Unauthorized Musical Parody of Hocus Pocus?! We all know Kate Pazakis for being an absolute genius and she has once again brought her magic to another brilliant and phenomenal UMPO show. The Unauthorized Musical Parody of Hocus Pocus is certainly unlike anything you have ever seen before. There’s a tremendous amount of comedy, an incredible array of song choices, and a spectacular amount of talent brought to the Rockwell stage. Writer and producer, Kate Pazakis has done it again leaving us all mesmerized with such an extraordinary show filled with so much Halloween thrill. 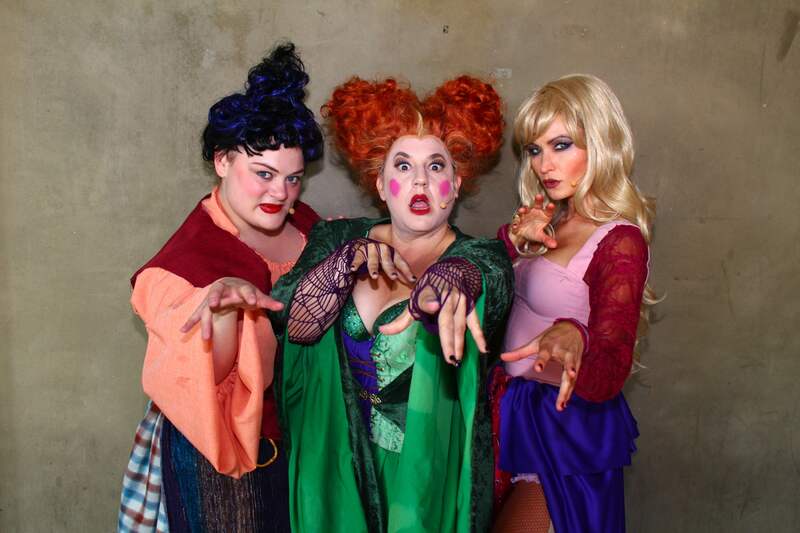 Kate Pazakis’ unrivaled intelligence and incredible talent for bringing out hilarious and entertaining shows is evident in her masterpiece of a creation – UMPO: Hocus Pocus. This outstanding show is bound to bring a whole lot of laughs and a big smile on your face. UMPO: Hocus Pocus will get you ready to bring out your greatest Halloween gear and embrace your inner Sanderson sister. The cast of the Unauthorized Musical Parody of Hocus Pocus are all so immensely talented and gifted and they truly bring so much passion to the show. They embrace their character so effortlessly and they allow the audience to join them on all of their fun Halloween adventures. One of the many terrific things about the Unauthorized Musical Parody Of series is that it is an interactive show. While you’re dining and enjoying some delicious food at The Rockwell Table & Stage or enjoying a nice cocktail, you might just happen to have a Sanderson sister right next to you casting a spell. All of the shows from Kate Pazakis’ UMPO series makes you feel like you are a part of the production and it makes the show even more of an unforgettable and magnificent experience. Starring in the marvelous show is Tony Award winning actress Marissa Jaret Winokur, Haviland Stillwell, Caitlin Gallogly, Peter Allen Vogt, Nathan Moore, Emily Morris, Emma Hunton, Teya Patt, E.K. Dagenfield, Lana McKissack, Ashley Argota, Gina D’Acciaro, Jordan Goodsell, Spencer Strong Smith, and Laura L. Thomas. UMPO: Hocus Pocus has a fabulous, all-star cast who works endlessly to bring out one sensational show you will never forget. I, Alexisjoyvipaccess had the greatest honor of covering the Unauthorized Musical Parody Of Hocus Pocus and I can sum up this article in six words: “You NEED to see this show!” There is no doubt that you will be left in awe with the indescribable talents of both the cast and Kate Pazakis bringing this production to life and the song choices are absolutely superb. UMPO: Hocus Pocus has every quality that makes it a total hit! Check out this VIPAccessEXCLUSIVE video below from the UMPO: Hocus Pocus show and be sure to bring your friends and family to go see this show that runs through November 4, 2017. You don’t want to miss out on all of the magical fun for everyone! Follow @UMPOSeries on Twitter and Instagram and visit tickets.rockwell-la.com to get your tickets to see the show now! Previous Article: Get Your Spook On With Nickelodeon’s “Lip Sync Battle Shorties Halloween Special” Airing Tomorrow, October 15th! Next VIPAccessEXCLUSIVE: ISINA Celebrated Talented Musicians And Their Industry Mentorship Program At The ISINA Global Gala!